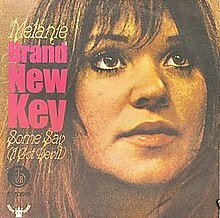 Han’s Worst Hits of the 70’s today features “Brand New Key” by Melanie. How cool could the Woodstock Festival have been? Melanie was one of three solo women who played at Woodstock. She was a relative unknown going into Woodstock having only one album released and nothing close to a hit single. Sha Na Na also played at Woodstock . Woodstock is one of the most overrated events of the 60’s- more on that next year with the big 50th anniversary. Now the focus is on Melanie and this incredibly annoying song. It is a combination of her voice and the song- a perfect match for making one of the worst hits of the 70’s list. This is probably a song you either hate or love. Melanie wrote the song- it was released as a single in 1971 and it went to #1 on the Billboard Hot 100. It would be her greatest success on the charts. She has had six hits in her career. I don’t love this song, but don’t hate it either. I thought it was kinda cute, but certainly not worthy of being a #1 hit. I loved this song as a kid, but these days I’ve relegated it to novelty song status. I do like some of Melanie’s serious songs. I’m glad to know I’m not the only one who thinks Woodstock the legend has been blown way out of proportion to what the actual Woodstock was. From what I can tell, there were maybe 200k who attended; certainly not 400k +. That and more has me protesting that enough is enough about Woodstock. Surely there were moments of fun, but a lot of it sounds completely miserable. And I say that as someone who really loves music festivals. I have an acquaintance who says she was at Woodstock. I’ve come to the conclusion that she wasn’t there. I think there is a lot of that. I think if everyone who claims to have been at Woodstock are counted- there would be like 5 million there!!!.. I am not a big fan of being in a big crowd. To me that would have been miserable. At least 5 million, ha! I love the large outdoor festivals if well organized. On that, I’m pretty sure Woodstock was mostly miserable. I have a good memory as a kid connected to it but ya…it’s pretty lame…I play it to aggravate people…so that says it all. I had no clue it was number 1… but why should I be surprised. I used to like it as a kid and it’s charming yet to me. I’m kind of shocked by what you all are saying about Woodstock! I wonder if it still smells of hippy there at the Woodstock site? … I can’t wait until next August and getting a change to write about Woodstock on its 50th anniversary!! Smells of hippy — hilarious — I wonder, do Mr. Yasgur’s descendants still own the farm… didn’t they try to do a Woodstock revival there a few years back? 50 years!?!? If I had Max’s time machine, I’d go back and get the real scoop. I don’t know who owns the farm- but I was shocked years ago to read that Max died at age 53–he looked so much older. I read something where they are talking about a 50th anniversary Woodstock concert. My advice don’t do it!… yes i think they did a revival at 25 years? It didn’t go well- rioting as I recall…. don’t go!! What??? That’s way too young. Farming is a brutal and thankless job from what I’ve seen, probably aged him before his time. I would *never* go to something like that at my age. As a 20 year old absolutely!! We have a big weekend festival thing here every year called “Electric Forest”. I talked with a person who lives near it. They said the young punks come in and clean the stores out of food and camping supplies on their way to it, then after it’s done, they just abandon the camping gear right there. Millennials!!!!!!!! Back at the 25th anniversary a friend of mine tried to talk me into going. I just looked at him and laughed no way. The odd thing about it was my friend was the last person you’d expect to want to go to Woodstock II- I am glad by my not going I saved him from going. He would have hated it I am sure- Woodstock II.. Electric Forest- is a cool name.. and it doesn’t surprise me at all that they woud just abandon their gear. Mommy and Daddy will buy them new stuff. I think Max suffered from heart disease. Exactly about mommy and daddy. I’m kind of surprised you wouldn’t go to Woodstock I or II or the 50th anniversary. It’s musical history in the making. I was only 8 when the first one came along. My friend who wanted to go to II- had been in Vietnam when the first happened. I think he thought II would be a big happening. From what I remember it was a mess…. I don’t like being in big crowds. The older I get that worse that gets..
Yeah, don’t love it or hate it….at the moment. But it would probably suffice as a wonderful replacement for waterboarding if someone were torturing you. On about the 20th replay, you’d probably WISH someone would just kill you and get it over with. I agree- a song you could tolerate once a year but after 20 in a row you’d want to just get it over with! Great point.